Before George H.W. Bush fades from memory into the darkness of history books, one more point needs to be made. 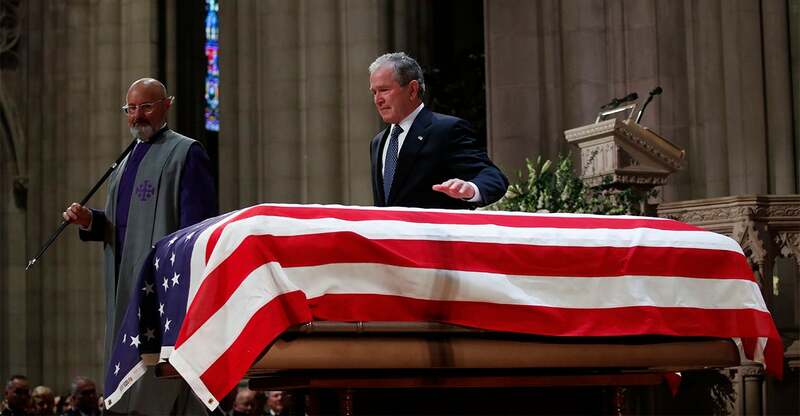 It is about the contrast between how most of the major media treated him when he was president and how they mostly (but not completely) did a 180 during their coverage and commentary of his funeral. Maybe reporters and anchors considered their largely favorable and complimentary coverage of the man in death as penance for their earlier sins during his life, but they still should be held accountable for what they said about him when it mattered. CBS News anchor Dan Rather interviewed Vice President Bush in 1988, before the Iowa caucuses. This was at the height of the Iran-contra affair during which the White House sought to circumvent a law banning funds to aid the Nicaraguan contras who were fighting communist forces. Bush and Rather shouted at each other in the 10-minute interview on live television. CBS began its segment on Bush with a taped report that suggested the vice president had played a greater role in the Iran-contra affair than Bush has acknowledged, and Rather hammered Bush about it during the interview, The New York Times reported. The candidate said he had been deceived about the true intent of the interview. Phone calls swamped switchboards at CBS News in New York and at Bush’s presidential campaign office in Washington. A CBS News official and Bush’s spokesman, said calls were overwhelmingly supportive of the vice president and negative toward CBS, The Times reported.